About The Back Shed and Homegrown Power. "No, it makes electricity. I built it." TheBackShed.com is a domain I registered back in the 90's with the aim of providing a place where I could share my hobbies and interests with the Internet community. Originally the site was all about electronics and BASIC software programming, a few other projects I was working on, and I wanted to have a forums section where other hobbyists could share their projects and ask questions. Then in 2003 I changed direction and set up the web site to include my home made windmills. I had built a few windmills, and really needed somewhere to show them off, as it were. The web site came together in early 2004. 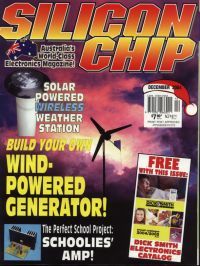 Later that year I sent an email off to Silicon Chip magazine, a popular electronics magazine in Australia and New Zealand. I was looking for any projects they published on power inverters and mentioned I had a web site about wind power. Leo Simpson, the publisher, replied. He said he had a look at my web site and asked if I would write some articles about windmills for the magazine. Having never written anything like a magazine article before, and failing English at high school, I was a little cautious. But the first article came together and passed the proof reading of my friends and family. It was published in Dec 2004, and 3 more articles followed. I must say I was very proud to have one of my photos on the front of a magazine I had read since I was a teenager. The first article was about windmills in general, and the remaining 3 articles were instructions on building a windmill based on the F&P motor and some laser cut steel parts I supplied as a kit. I sold about 20 of the kits, and in hindsight I would have done everything differently. The laser cut kits were costing me more to make that I was selling them for, and I later developed a better design that didn't need any laser cutting. The articles resulted in increased traffic to the web site, so I spent some time on the layout and content to make a visit to TheBackShed.com worth while. Its lucky that I've been involved with web site design in some way for the last 10 years, so keeping TheBackShed.com up to date is fairly straight forward, but like any hobby or interest, does take up a fair bit of my time. I'm passionate about clean energy, there is an abundance of free power out there, we just need to use it. Wind, solar, hydro, these are all power sources that the average person, with a few handyman skills, can take advantage of. So the purpose of this web site is to share the information we need to make this happen. All information here is free, there are no "windmill plans" for sale. I'm not here to sell anything. The web site does earn a little money from advertising, enough to pay for hosting expenses and some funds towards my hobbies, but that's not why I put so much time into the web site. I do it for the common good, sharing information and helping other people get started in clean power generation. TheBackShed needs your windmill, solar, electronic stories. If you can write a story on a windmill you have built, or a electronic controller you designed, or anything of interest to visitors to this site, then please let me know. Or maybe you have a product, renewable power related of course, that you want to sell, and you are willing to write up an article about it, then feel free to contact me.